North Korea threatens to cancel the much anticipated June 12 summit with Trump over provocative military drills carried out by the United States and South Korea. "We have no information on that. Let's not get ahead of ourselves. We need to verify it." - State Department spokesperson Heather Nauert said, according to NBC. North Korea also reportedly called off scheduled talks with South Korea. Hopefully the meetings will occur as it's major focus is talks on denuclearizing the Korea Peninsula. North Korea's Central News Agency reported the military drills between the U.S and South Korea to be a "provocation" and the purported Max Thunder military activities were in readiness for an attack, South Korean News outlet Yonhap reported. "We are aware of the South Korean media report. 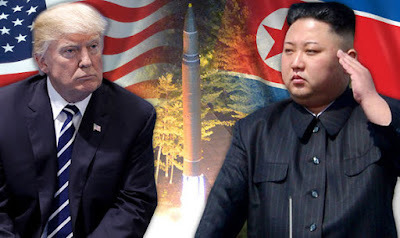 The United States will look at what North Korea has said independently, and continue to coordinate closely with our allies." Press Secretary Sarah Sanders said in a statement. Colonel Rob Manning, a spokesperson with the Pentagon, said the drills were "recurring," "annual," and "routine." Manning claimed the "purpose of the training" is to "maintain a foundation of military readiness." "While we will not discuss specifics, the defensive nature of these combined exercises has been clear for many decades and has not changed," -Manning said. The Max Thunder drills are joint military air exercises between the US and South Korea. Last year's exercise involved 80 aircraft and around 1,500 military personnel.